Emergency first aid is one of the most comprehensive one full day training offered to Canadians. This course covers the most basic and common emergency situations which people might come across. Participants signed up for this class also will be taught simple CPR skills. This class is offered via St Mark James training and individuals that complete the training course will get a workplace approved CPR and first aid award. This blog will outline for you the details and specific features of a St Mark James emergency first aid, CPR and AED lesson. Scroll to the bottom of the page to view the available courses and to register for a workplace approved emergency first aid course in Halifax. 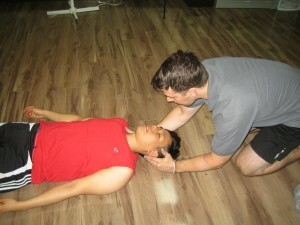 The length of an emergency first aid, CPR and AED class hinges on the quantity and skill level of the candidates as well as the CPR option connected with the training course. Emergency first aid, CPR and AED training will vary between Eight to ten hours. This first aid course is normally completed in just one entire day. Certain suppliers provide this course in two shorter days. All courses incorporate automated external defibrillator education. These subjects will be covered thoroughly within a emergency first aid, CPR and AED course. Applicants that complete emergency first aid, CPR and AED get a card stating that you have completed the course. This cert also states education in CPR as well as the usage of automatic external defibrillators. Cert granted to successful candidates satisfy all academic, government and workplace benchmarks for emergency 1st aid and CPR training. Customers are also able to register in emergency CPR and first aid renewal / re-certification lessons. These kinds of lessons are provided for candidates who have formerly been issued an emergency first aid and CPR card and want to restore accreditation. Discover simplest first aid skillsets by taking an emergency first aid and CPR class in Halifax.